This healthy dinner trio is superhero food! 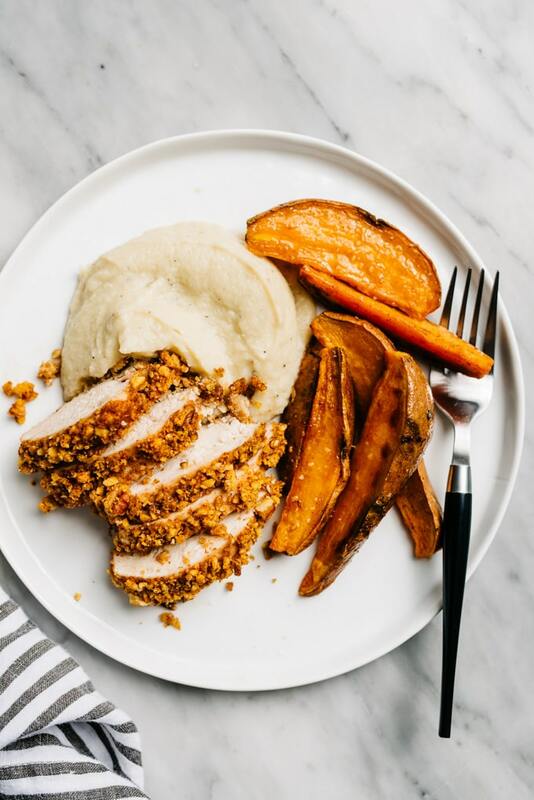 The star of the show is crispy, crunchy pecan chicken, served with golden sweet potato wedges and creamy cauliflower puree. This plate is loaded with healthy fats and essential vitamins and minerals, and doesn’t skimp on flavor in the least. >>> Pin it now! 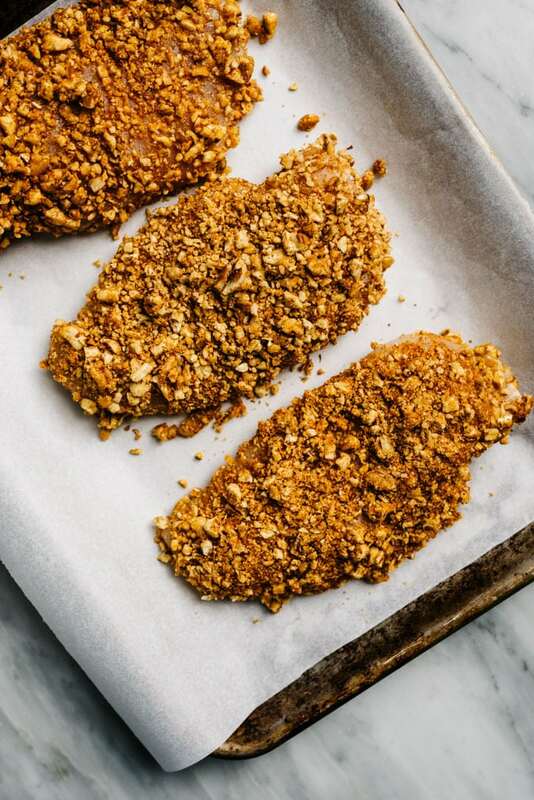 Click here to save this Pecan Chicken to your healthy dinner recipes board on Pinterest. 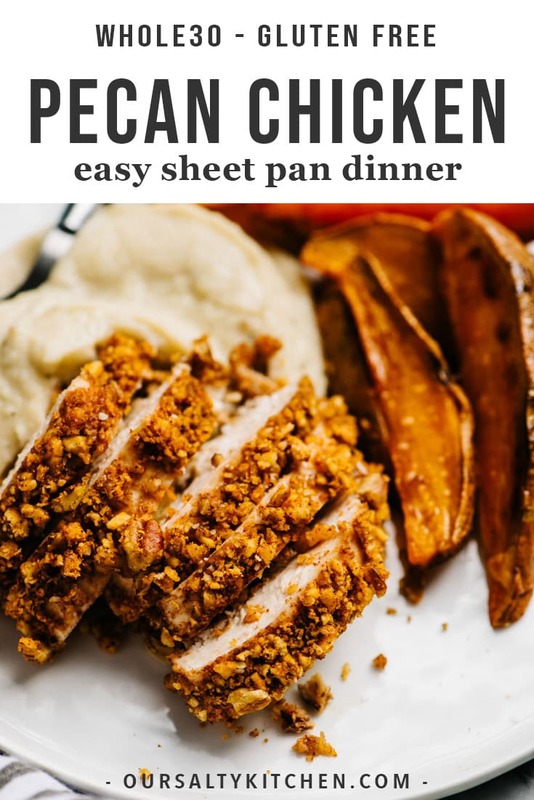 Simple food is good food, and this Pecan Chicken Dinner is proof! This (mostly) sheet pan dinner is made with just a handful of real food ingredients and lots of warming spices. 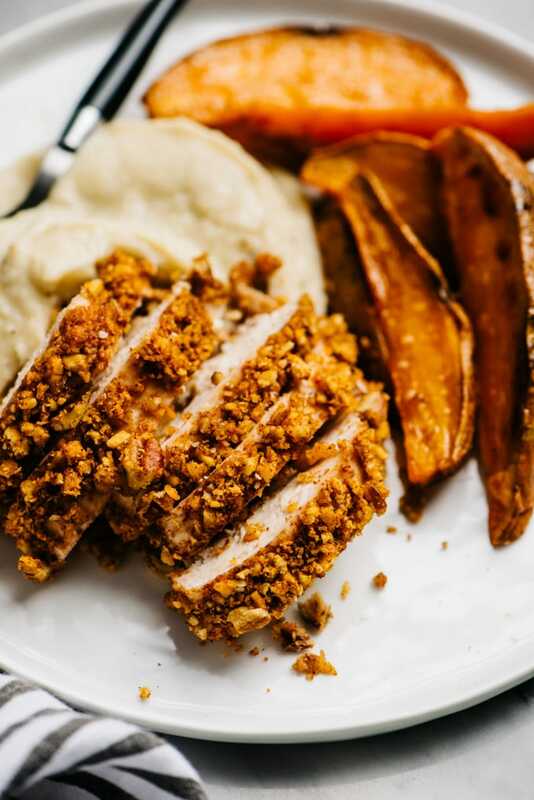 Nutty pecan chicken with crispy sweet potato fries and pureed cauliflower make a powerful nutrient dense trio. Superhero food! 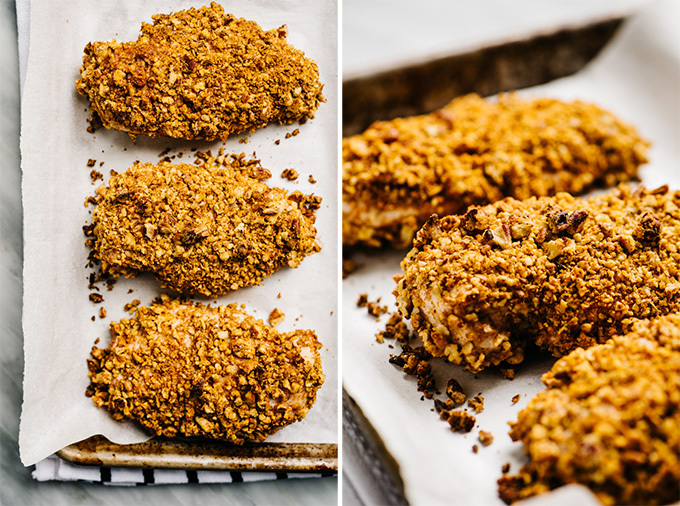 This pecan chicken trio is super easy to prepare, but it does take a bit of time (about an hour). Reserve it for a weekend or a snow day if you’re a 30-minutes-or-less kind of weeknight warrior (and check out the variations section for a couple ways to make this in 40 minutes!). 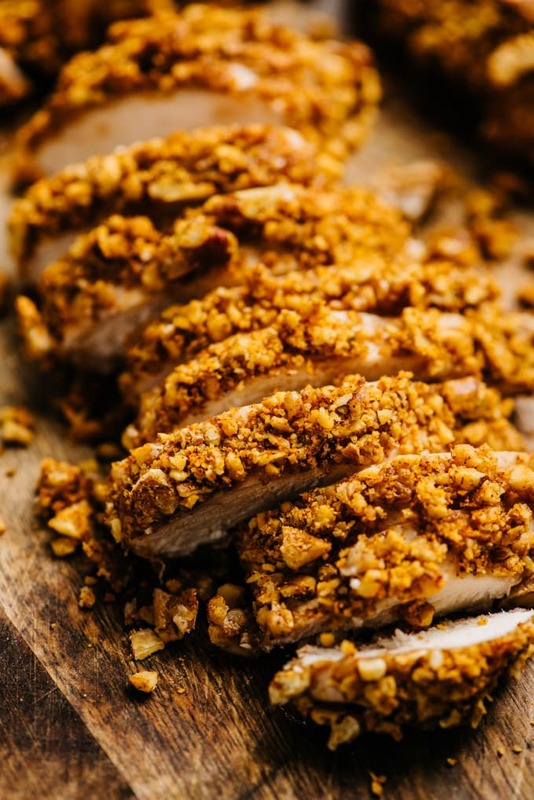 The star of this dinner spread is spiced pecan crusted chicken breasts. They look oh-so-fancy, but they’re oh-so-easy. And surprisingly healthy! Made with a simple crust of eggs, chopped pecans, and spices, these babies are Whole30 and gluten free slices of goodness packed with protein and healthy fats. 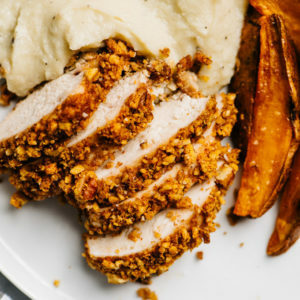 Chicken breasts are coated in crushed raw pecans mixed with flavorful spices for a quick and easy “breading” that provides a nice contrast to creamy sweet potatoes and cauliflower puree. My original intent for this recipe was a meal prep bowl, but sadly the chicken doesn’t reheat well in the microwave. The recipe easily scales up or down, though, so prepare just enough for what you’ll immediately enjoy. This pecan chicken dinner is done in two stages and comes together in under an hour. First you’ll start the cauliflower puree, then you’ll prep the chicken and fries and bake them at the same time. All three components are finished at roughly the same time. You got this! 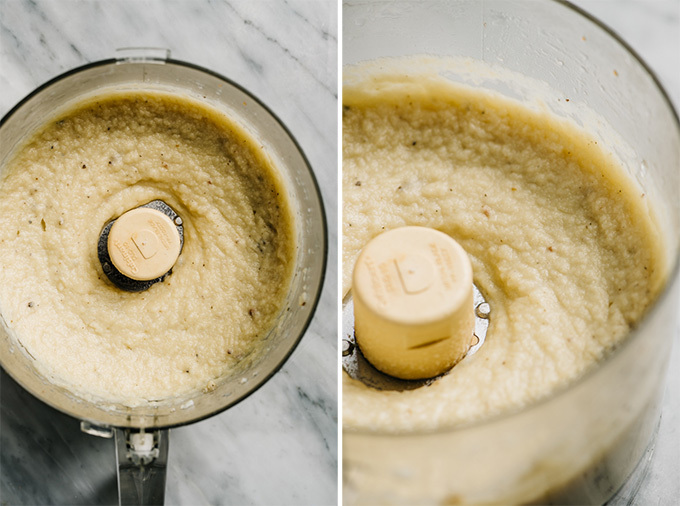 Cauliflower puree is a terrific way to squeeze just one more veggie onto your plate without feeling deprived. Chop a head of cauliflower into 2″ florets. Place the florets into a 4-quart saucepan, then add a cup of broth or stock and some salt and pepper. Bring the liquid to a boil, then reduce the heat to maintain a simmer, cover, and steam the cauliflower until very tender – about 20 minutes. It’s ready when you can gently press the stem end of a piece of cauliflower with a butter knife and the flesh easily depresses. Using a slotted spoon, transfer the cauliflower to the bowl of a food processor. Add in a pat of butter for creaminess (or ghee to keep it Whole30 or paleo). You can also add in a little shaved parmesan cheese or a splash of heavy cream. Place the lid onto the food processor and pulse a few times to get the puree going. Then flip the motor to continuous and process until the puree is creamy. If it’s too thick, add some of the cooking liquid until the consistency is just right for you. Lastly, taste for seasoning. Add small amounts of salt, butter, and/or cream if needed, then process for an additional 10-15 seconds. While the cauliflower is steaming, you’ll prepare the sweet potatoes and chicken. Slice the sweet potatoes into wedges, then toss with olive oil, paprika, salt, and pepper. Lay them onto a parchment lined baking sheet, leaving a little room between each wedge to ensure proper crisping. Roast the sweet potatoes at the same time as the chicken in a 400°F oven for 20-25 minutes. Flip once halfway through. As noted above, you’ll bake the chicken at the same time as the sweet potato wedges. Buy them pre-crushed. This is a reasonable option, but the pieces will be on the larger side. Not ideal, but doable. Buy them whole, and chop ’em with a chef’s knife. That’s a lot of knife work? Naaaah. Toss the whole pecans into a food processor and pulse a few times until crushed. Ding ding ding! This is a solid plan. Bonus: you’ll get some variegated sizes that will fill in the various nooks and crannies for a pretty darn even coating. Grab two shallow bowls large enough to fit the chicken breasts. Place the chopped pecans in one bowl, then mix in the spices. Crack an egg into the other bowl, add a tablespoon of water, and whisk until smooth. Pat the chicken breasts dry (this will help the pecan coating stick best), then dunk the chicken breast first into the egg mixture, and then into the crushed pecans. Press the chicken into the nuts to make sure the breading really sticks, then flip and crust the other side. Transfer the crust chicken to a parchment lined baking sheet. Add both the chicken and sweet potatoes to the oven and bake for 25 minutes, plus or minus a few minutes, or until an instant read thermometer reaches 165°F when inserted into the thickest portion of the breast. My chicken was on the larger side (about 7 ounces each) and took exactly 26 minutes. Remove the chicken from the oven and allow to rest for about 5 minutes. Then slice against the grain into slices. The fat content for this recipe is high, but it’s largely monounsaturated and comes from the pecans. If you’re dairy tolerant, adjust the creaminess of the cauliflower puree by adding a bit of heavy cream or parmesan cheese (see notes above). A splash of cashew milk or a tablespoon of nutritional yeast works beautifully too. If you’d like to shave 20 minutes off the total time, skip the cauliflower mash and serve with a green salad. You’ll keep most of the nutritional content and maintain a plate that’s friendly to most diets (low carb, Whole30, and dairy free). You could also round out this dish with pre-cut and pan-seared zoodles. Simply sautee in 1 tbsp olive oil over high heat for 2 minutes, then sprinkle with salt and pepper. So easy! If you love to sauce your chicken, this is awesome with honey mustard. My go-to homemade recipes are this Whole30 Honey Mustard from What Great Grandma Ate or this sugar-free Healthy Honey Mustard from Baby FoodE. DID YOU MAKE THIS PEACN CHICKEN RECIPE? I WANT TO SEE YOUR CREATIONS! SNAP A PICTURE AND SHARE IT HERE ON PINTEREST. 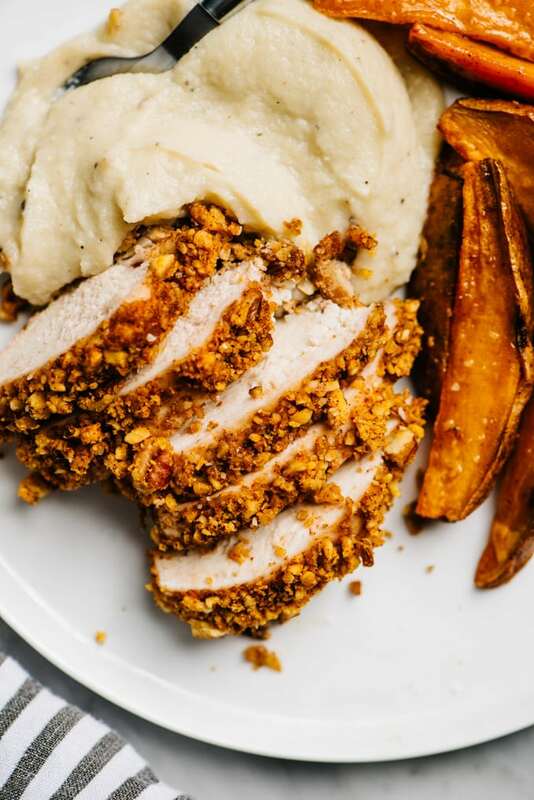 Chicken breasts are coated in crushed raw pecans mixed with flavorful spices for a quick and easy "breading" that provides a nice contrast to creamy sweet potatoes and cauliflower puree. My original intent for this recipe was a meal prep bowl, but sadly the pecan chicken doesn't reheat well in the microwave. The recipe easily scales up or down, though, so prepare just enough for what you'll immediately enjoy. Position two racks in the upper and lower thirds of the oven, then heat the oven to 400°F. Line two baking sheets with parchment paper and set aside. Start the Cauliflower Puree. Place the cauliflower florets, broth, salt and pepper into a 4-quart sauce pot. Bring the liquid to a boil, reduce the heat to medium low, cover and simmer until the cauliflower is very tender, 15-20 minutes. 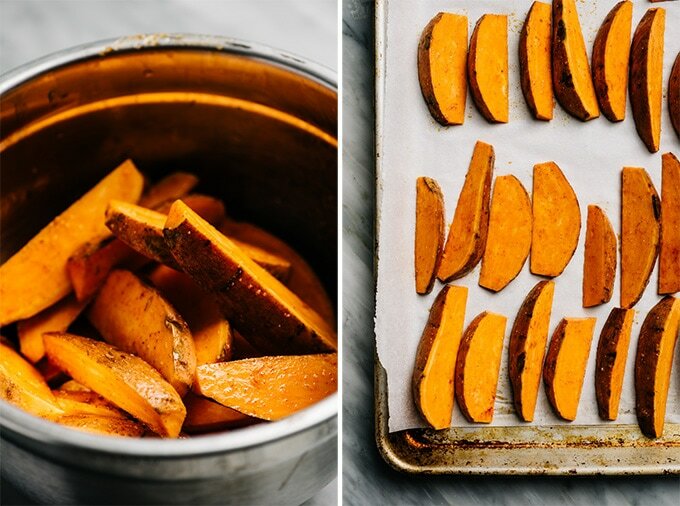 Prep the Sweet Potato Wedges. 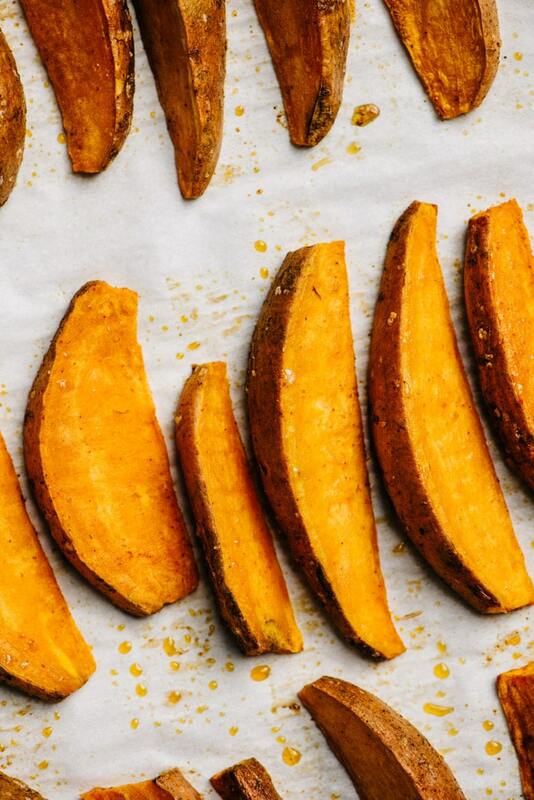 Toss the sweet potato wedges with the olive oil, paprika, salt, and pepper. Spread the wedges onto a baking sheet and transfer to the oven. 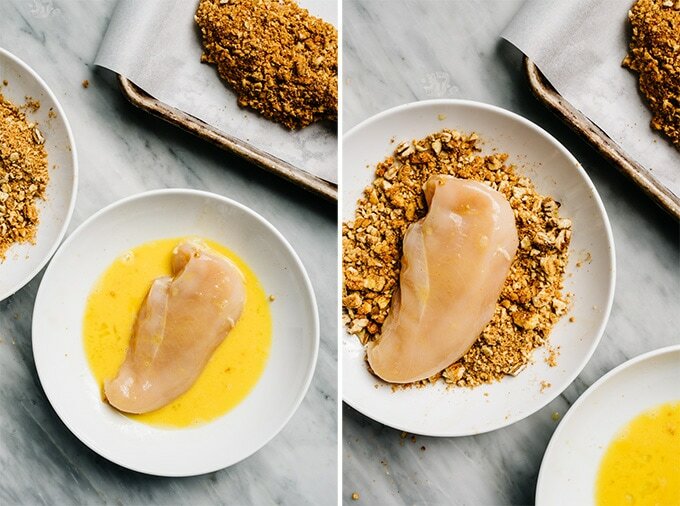 Prep the Pecan Chicken. Beat the egg in a wide bowl with one tablespoon of water. Place the pecans, salt, paprika, nutmeg, and ginger into a second wide bowl. Stir until well-combined. Pat the chicken dry. Dip the chicken into the egg, then place into the pecan mixture and press to adhere the pecans to each side. Transfer the chicken to a second parchment lined baking sheet. Bake the Potatoes and Chicken. Transfer the baking sheets to the oven and bake for 10 minutes. Remove the sweet potato tray from the oven, flip the wedges, then return the sheet to the oven, rotating the positions of the baking sheets. Bake an additional 10-15 minutes, or until the sweet potatoes are crispy and caramelized around the edges and an instant read thermometer reaches 165°F when inserted into the thickest portion of the chicken. Allow the chicken to rest for 5 minutes, then slice. Finish the Cauliflower Puree. While the potatoes and chicken are baking, season and puree the cauliflower. 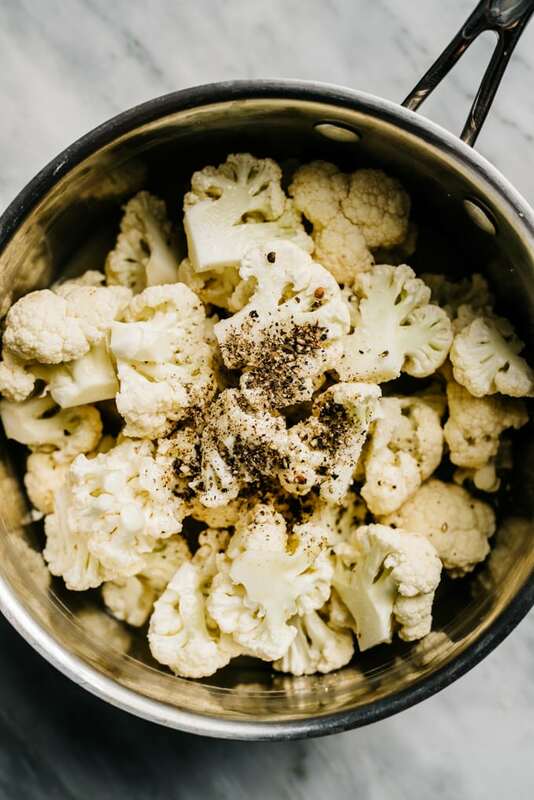 Use a slotted spoon to transfer the steamed cauliflower to a food processor. Add the butter and cream (if using) and process until completely smooth. Add cooking liquid, a tablespoon at a time, until desired consistency is reached. Portion the cauliflower puree onto the plates and top with the pecan chicken. Serve with a size of sweet potato fries. Enjoy immediately! So simple! You’re a genius! I’m definitely going to try this.